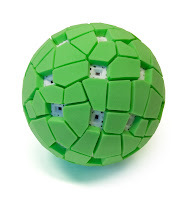 October 15, 2011 /Photography News/ Researchers at the Technical University of Berlin have come up with an ingenious Throwable Panoramic Ball Camera. 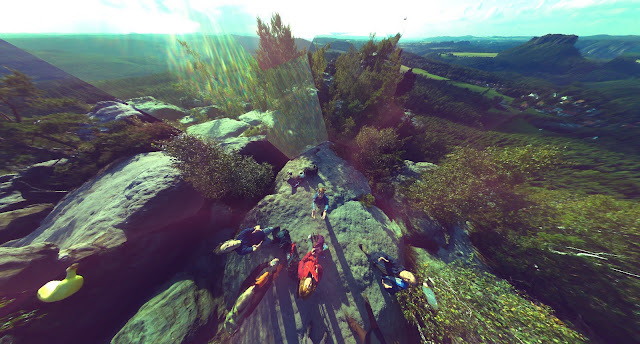 Developer Jonas Pfeil and his colleagues created the ball to make it easier to capture a full spherical panorama. The concept device is a throwable multi-sensor camera about the size of a cantaloupe that snaps a single, instant 360-degree panorama. You simply toss the ball up and then retrieve the pics via USB and see them in a special viewer. Arranged around the ball are 36 2-megapixel fixed-focus cellphone cameras. When the ball is thrown, they fire simultaneously at the apex of the ball’s flight, capturing the scene in every direction (including the photographer). What's even more amazing about this device is it is built in such a way that once it's thrown in the air it automatically takes the picture at the highest point. The entire camera is packed into a 3D-printed ball-shaped enclosure that is padded with foam, so it’ll probably survive a landing if you can’t catch it. Pfeil will be showing off the sphere at Siggraph Asia 2011 in December. The patent is pending. But can you play football with it! This is a really cool concept as you can get a 360 pano on the altitudes and locations not otherwise possible with a tripod, but the quality will probably be always mediocre as it's all moving and shaking.. the idea is ingenious though! Looking forward to seeing it in the stores. Thanks dear for this post. I am providing servicies of money problem solution.